This past Sunday I was a dinner organizing machine! I prepped various components for dinners this week to make my life easier and dinner quicker. 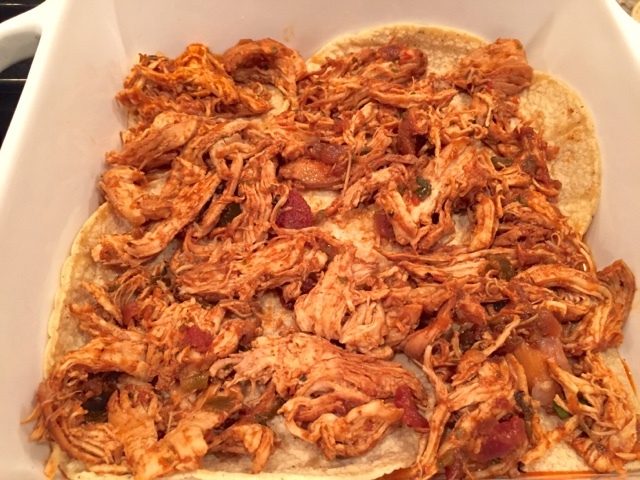 One of those prepped items was my salsa chicken recipe, which I love and make all the time. 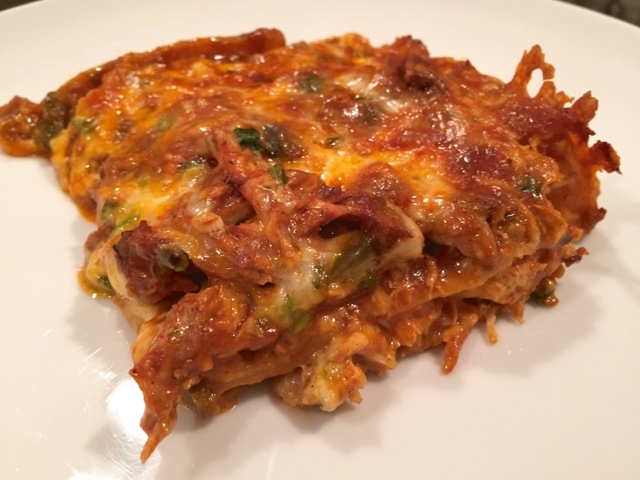 Having done that, it saved me so much time making this enchilada casserole! The funny thing is, I meant to actually make enchiladas but I had one of those nights that truthfully, I was lazy. 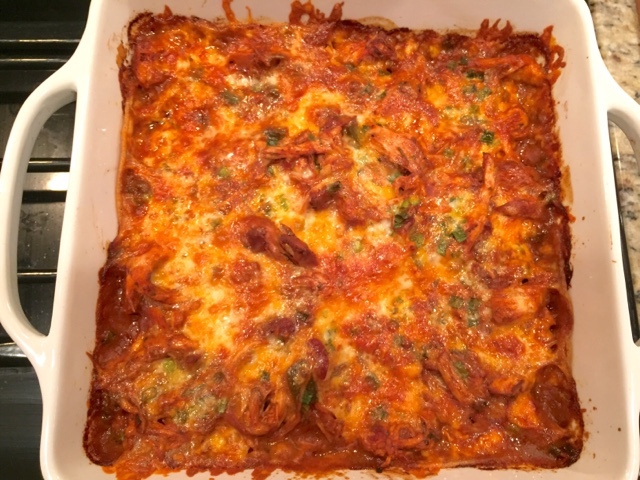 The night before I made sausage lasagna and thought "hey, I could just layer these and save the time of rolling!". I did just that and will never go back! This was so delicious and quick...easily a new weekly staple of mine. Simmer the chicken with a jar of salsa until cooked through and tender. Shred the chicken and reserve. I grated my own cheese because I think it melts better but obviously the pre-shredded saves a ton of time! So use whatever you prefer. 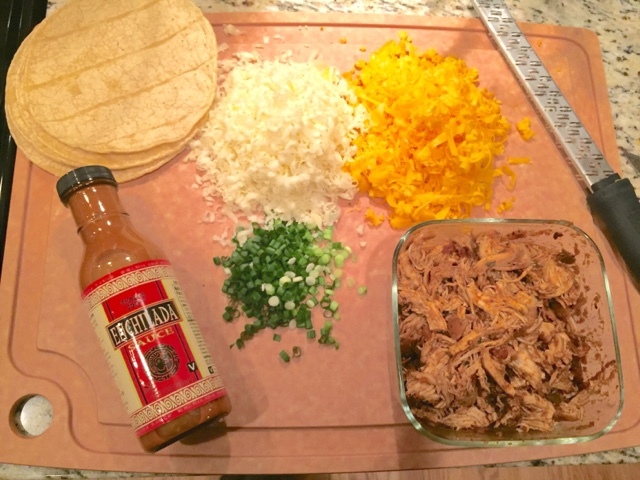 This was the first time I used this Trader Joe's enchilada sauce and it was actually pretty darn delicious! 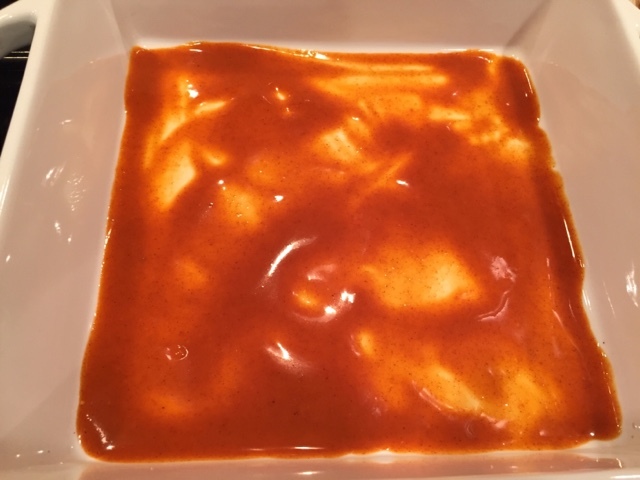 Butter or spray your baking dish and pour in about 1/2 cup sauce to coat the bottom. 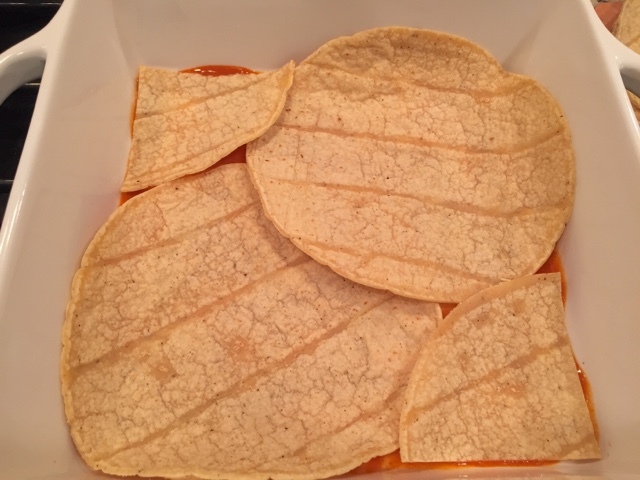 I cut one of the tortillas into quarters to fit my baking dish to avoid too much overlapping (more carbs). This sort of felt like a food puzzle and I love puzzles! 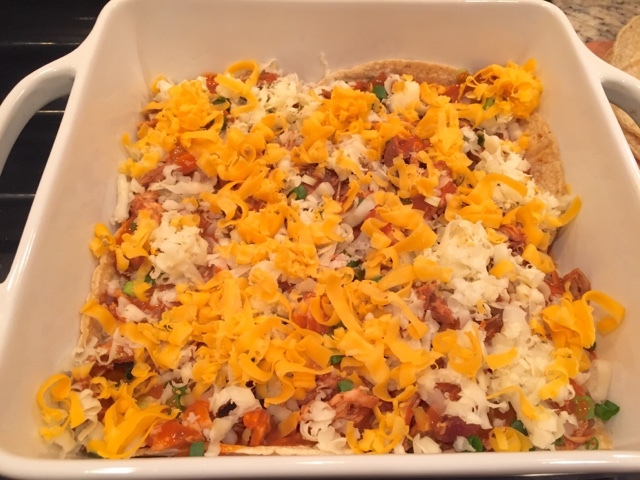 Use about half of the chicken for the first layer and just spread it out evenly. 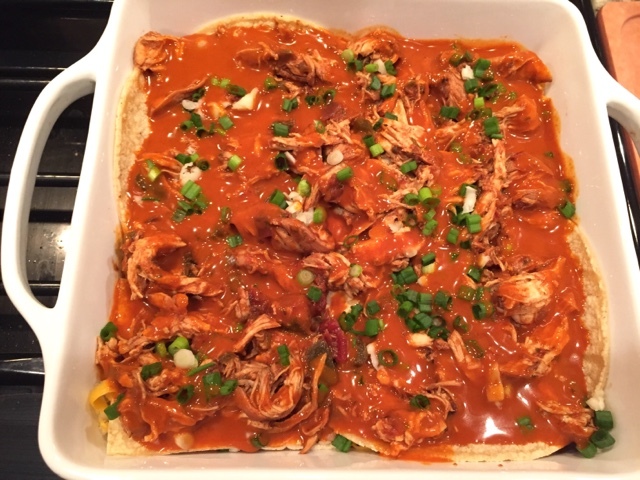 Pour a nice layer of enchilada sauce over the chicken, about 1/2-3/4 cup. Also sprinkle on a layer of fresh green onions or cilantro. I'm a cheese lover so it's easy to go overboard! 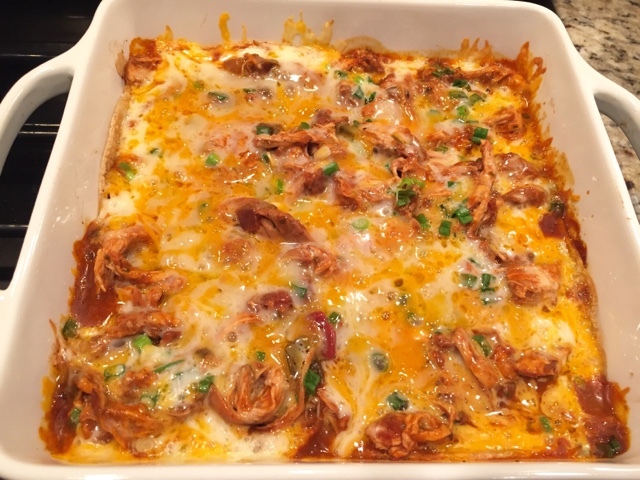 Layer half the cheese over the chicken without neglecting any corners or edges! Repeat the process all over again, alternating the corners with the quarter pieces. 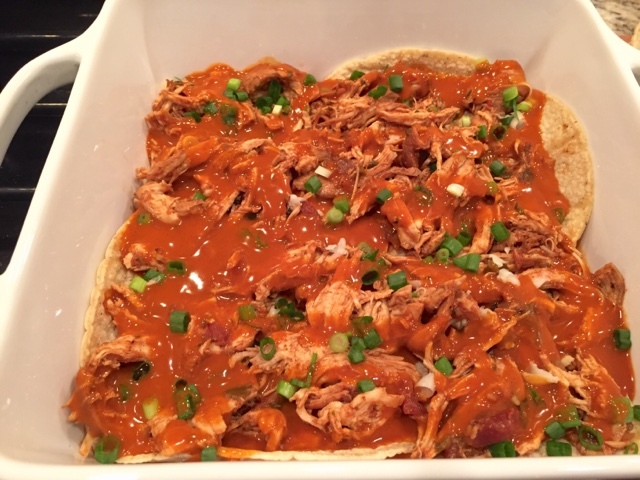 I gave the top layer a more generous pour of enchilada sauce because I like things saucy! Top with every last shred of cheese. Cover with foil and bake for 20 minutes until the cheese is bubbling and melty. Remove the foil and bake for an additional 10-15 minutes. I prefer the cheese past the golden stage. This is true for frozen pizza as well. I like when the edges and corner are slightly crisp and caramelized. Holy moly. This is so good! I was in a hurry to eat otherwise I would have topped this with sour cream, jalapenos, fresh cilantro, black olives, guacamole, tortilla chips, shredded lettuce...possibilities are truly endless! I've teamed up with my friend Lauren to bring you another fun game day snack! I love Chex Mix and didn't realize how easy it is to make at home...not to mention how much Chex Mix you get from the recipe. I gave more than half of it away and still had a huge bag for myself! 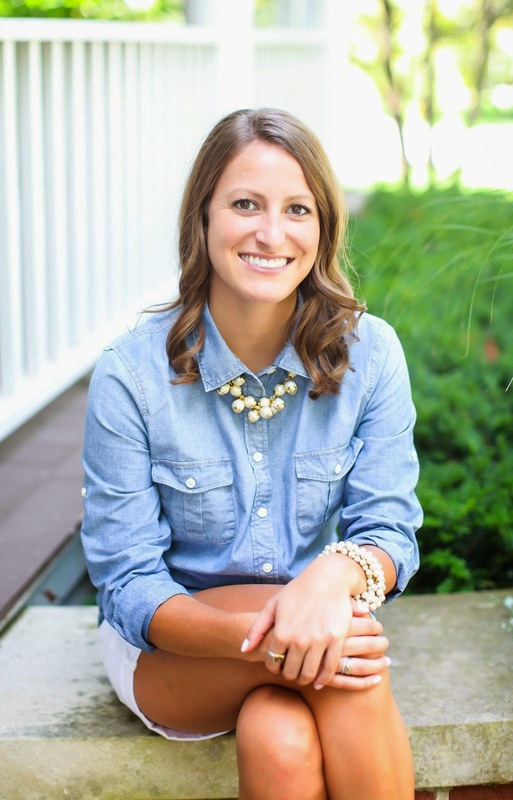 You can find the full recipe and beautiful glamour shots on Lauren's blog, here, but here's a little preview! *Have fun with this! 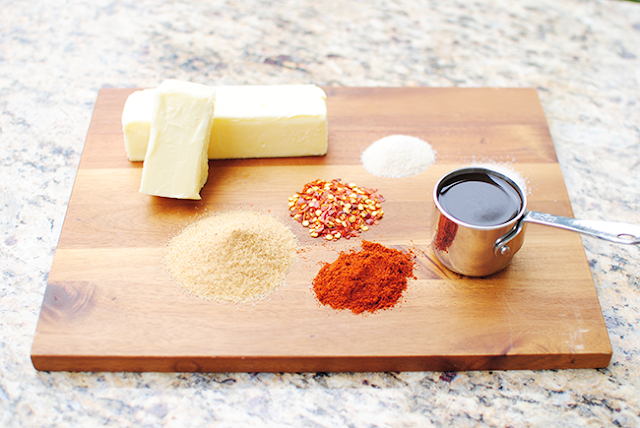 Use whatever seasoning combinations you like! 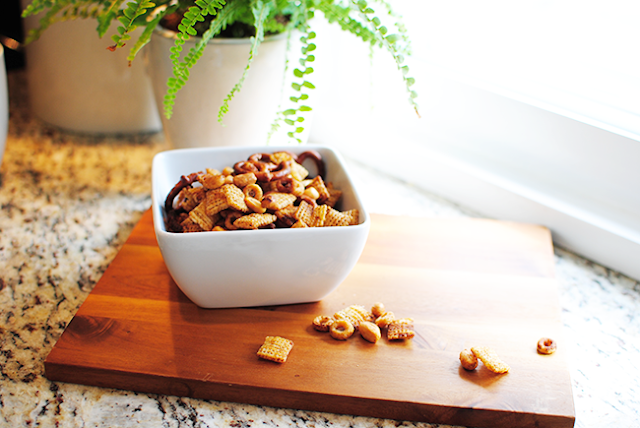 There are no rules with Chex Mix...just butter. You need the butter. Melt the butter in a bowl or measuring cup (for easy pouring) and add in the rest of the seasonings. 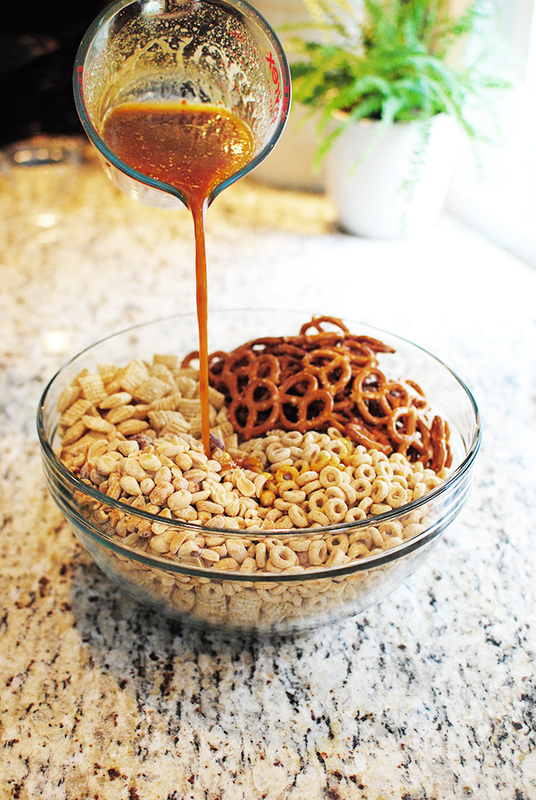 Mix until well combined and pour it over the cereal mixture. Turn out onto a large baking sheet and spread out in a single layer. Bake at 325 for an hour, stirring the cereal every 20 minutes. *If you add a handful of candy corn to this finished mix it will blow your mind! 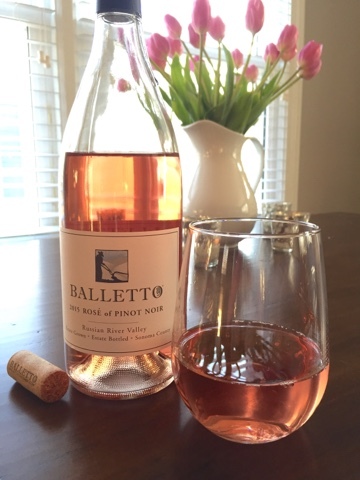 I LOVE the salty sweet combo and it makes this a festive fall treat! Addition to the Callaway Family.. If I haven't already expressed this, I'm a *mild* crazy cat lady. 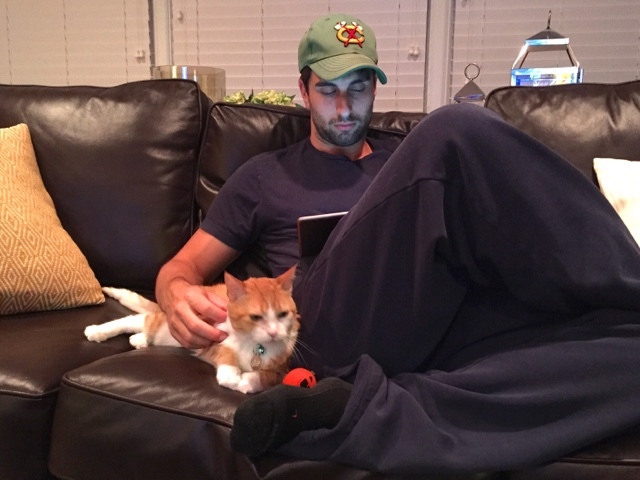 My parents, after years of begging as a child, got "our family" (me) a kitten when I was going into high school. We named him Toby and he is most handsome cat I've ever laid eyes on! With life comes college and apartments which meant Toby stayed at home with my parents... Until my birthday weekend a few weeks ago. My parents rang the doorbell Friday night and had Toby, with all of his belongings, to move in! I hate surprises but that was a great one! Poor Sean. We're married now, there's not much he can do but be patient and oblige to testing him out. Well, life has just been glorious with my two boys and I think Toby has finally adjusted to his new home! He is very curious with our meals and loves licking any sour candy. He even took a nibble out of my Chipotle burrito last week...yup, he's my cat all right! If you aren't a cat fan, I'm sorry for this story, and I'll try my best not to talk about him constantly. Our little family has grown to 3 and I couldn't be more ecstatic about it! 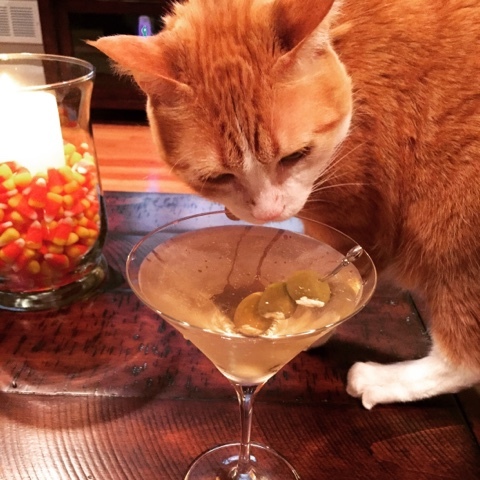 He likes his martinis extra dirty, straight up, and with blue cheese olives. Oh and the irony? Toby and Sean are bff's. 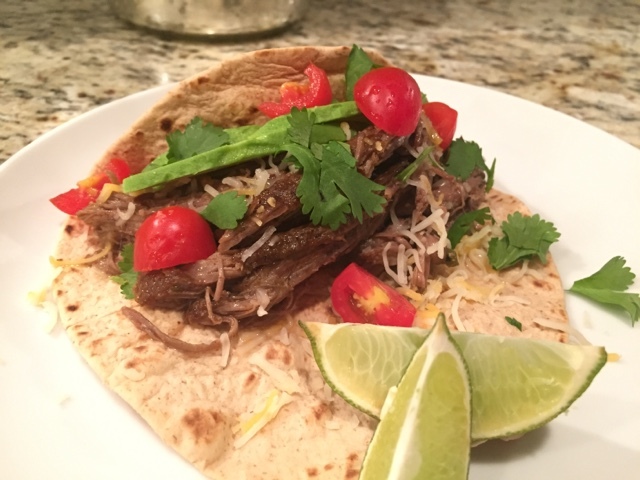 I've been making this beef Barbacoa recipe a lot lately and normally I make it in the oven in my Le Creuset, because, I always look for an excuse to use it! I do love the flavor of roasting it in the oven. It's richer, slightly crispier and overall delicious. Meals like that require time, like a lazy Sunday but for weeknight cooking it's not so practical. 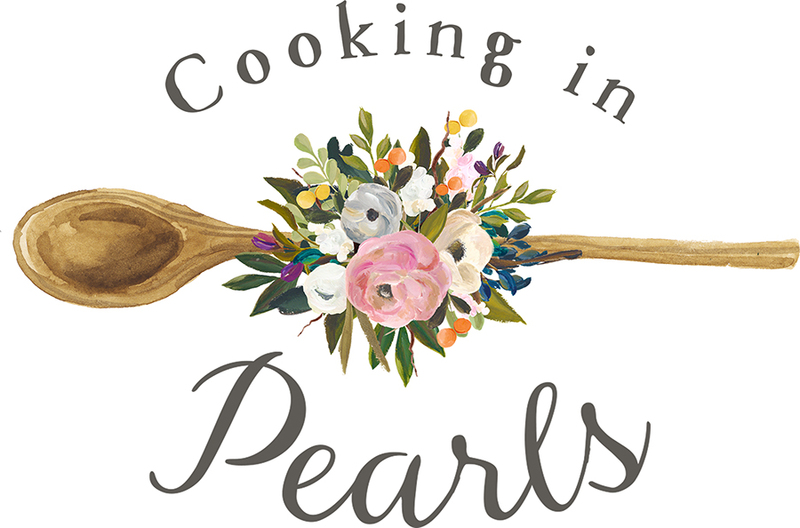 Recently, I'm taken a huge fascination with my slow cooker and decided to try the same recipe in that instead, hoping to make things a little easier. It was good...but wasn't as flavorful as the original version. 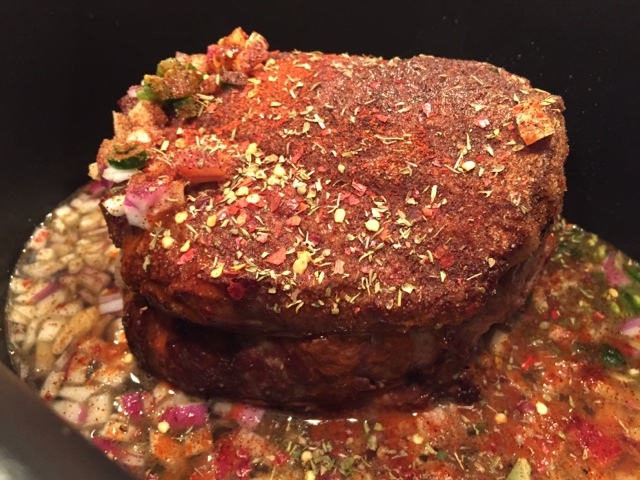 I decided to make it again but sear the meat first-adding more flavor and depth. So much better! 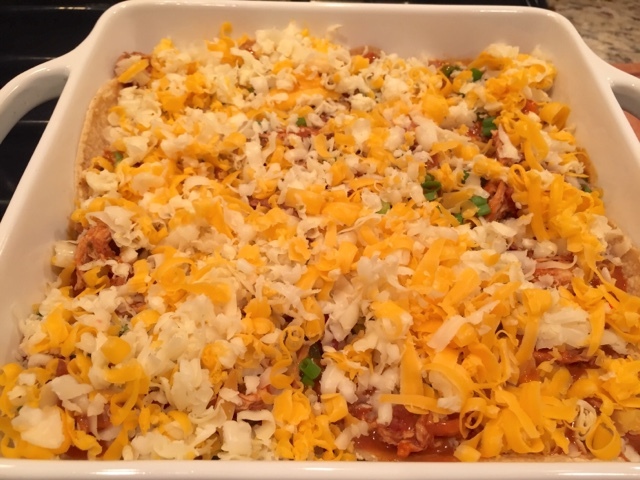 If I have the time, I'll still make this in the oven, but this is a great alternative and much easier for busy weeknight meals. Problem is, after periscoping the whole process from start to finish I realized I didn't take any pictures. Such a rookie. So here I am, 2 days later, making the same dish again! 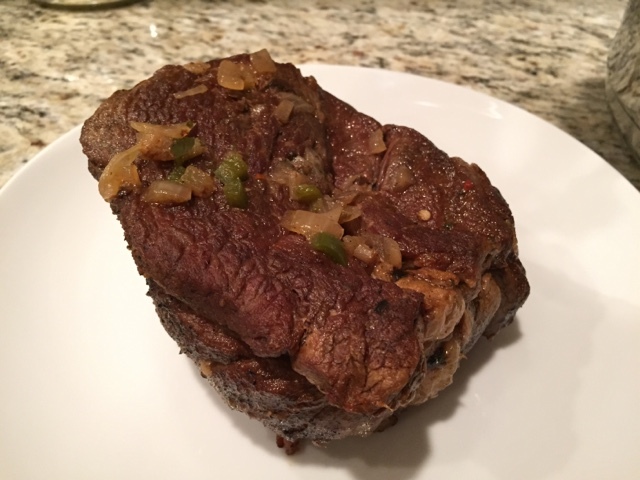 Thank goodness it was a chuck roast and not a beef tenderloin...that would have been an expensive mistake! This is a great recipe that's easy and flexible using what you have on hand. Better yet, you can prep the whole thing the night before and pop it in your slow cooker the next day! That's what I did today and my husband was happy to "cook dinner" tonight, aka, place the insert in the slow cooker and press start! 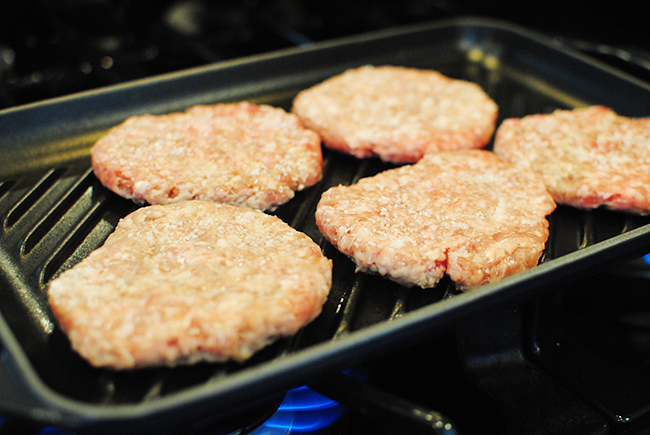 Start by preheating your pan/skillet on high heat for about 2 minutes or until wisps of smoke start arising. 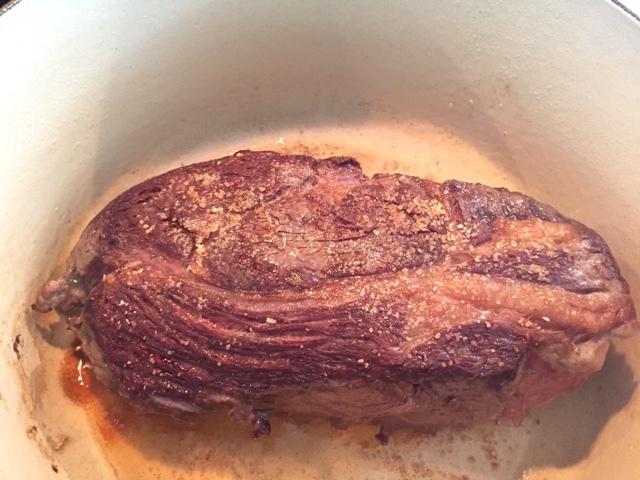 Season your chuck roast with about a tbl of salt and pepper. This gives it a nice crust and flavors a lot of meat-so don't be stingy! Drizzle in a little oil (olive oil, coconut oil, canola oil, whatever you prefer) and sear the meat on all sides, about 2 minutes on each. 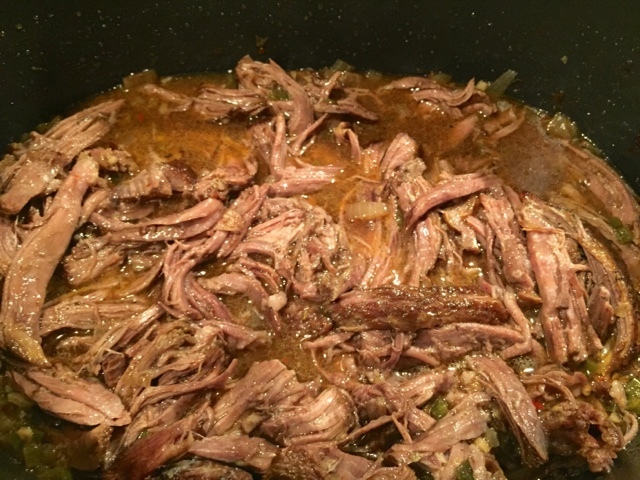 When the beef is caramelized, remove it from the pan and place it into your slow cooker insert. 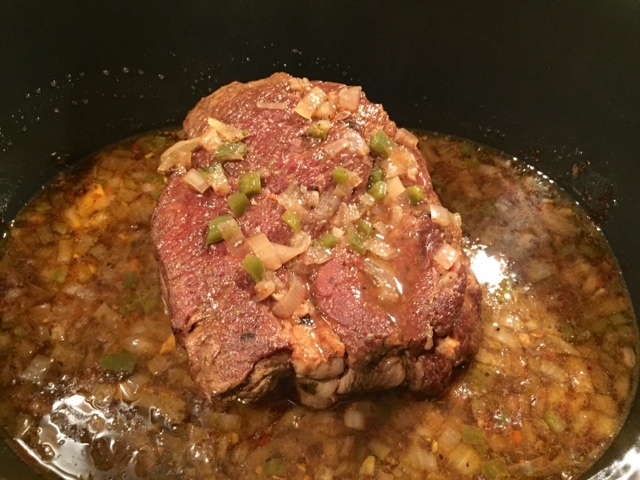 You'll want to deglaze your pan you seared the beef in so go ahead and pour in some beer or wine. Keep the heat on medium and scrape the bottom of the pan to lift up those yummy bits! 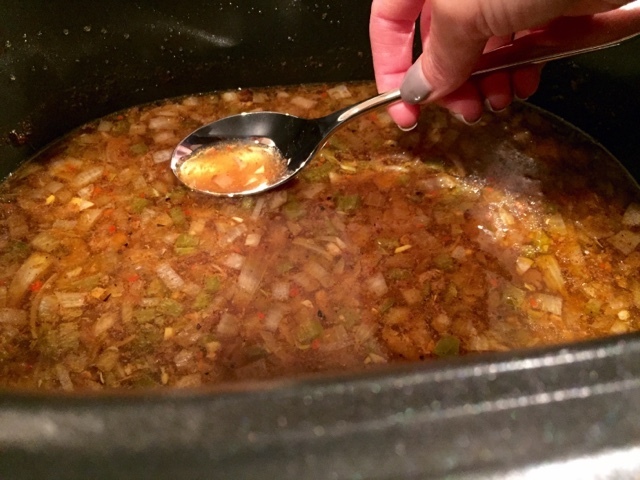 You'll also want to add about 1/4 cup of beef broth. This creates nice rich beefy flavor! Pour that over the beef and add in your onion, jalapeño, and garlic. Next, add in your seasonings and hot sauce. If you have salsa on hand, that adds nice flavor too. If you don't, no sweat! If you plan on cooking this now, cook it on low for about 7 hours. Otherwise, cover the insert and pop it in the fridge until tomorrow morning. I would definitely pull this out of the fridge at least a half hour before putting it in your slow cooker. 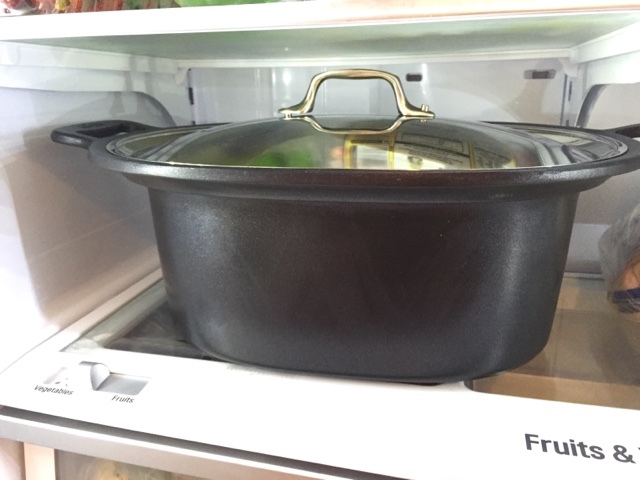 The drastic temperature change may overwork your slow cooker and take awhile for your meat to come to room temperature. 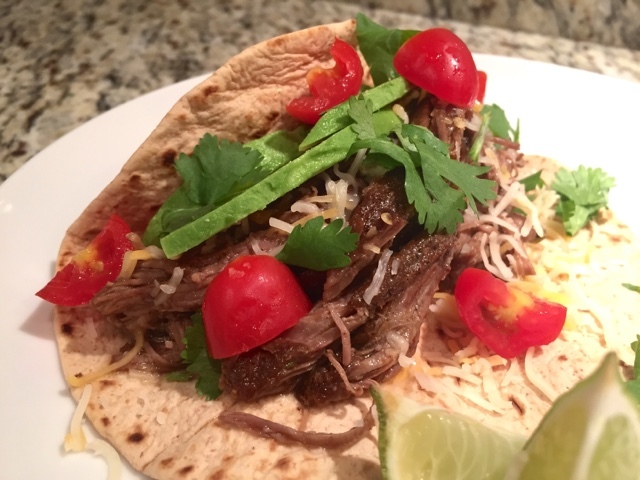 Check the meat every few hours (if you're home) to be sure there's enough moisture in the slow cooker. I had Sean flip the meat now and again to evenly distribute the flavors, but if you don't have a husband that works from home, it's not too crucial of a step! In about 7 hours you'll find fall-apart tender meat that is so so good!! 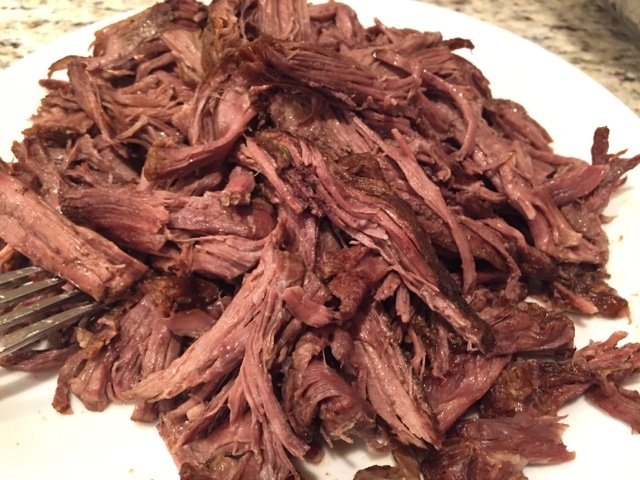 Remove the beef from the slow cooker and shred, on a plate or cutting board. Not too finely, just running your fork through it and removing any fat as you see it. Take a spoon and a small bowl and skim the surface of the broth to remove any fat that will surface at the top. 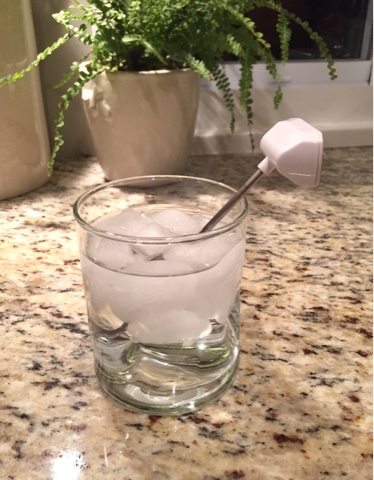 I removed about 1/4-1/2 cup worth. Don't go crazy, you just don't want it too greasy! Add the luscious meat back to the broth liquid and it's ready to go! Taste for seasoning, you can always add more! 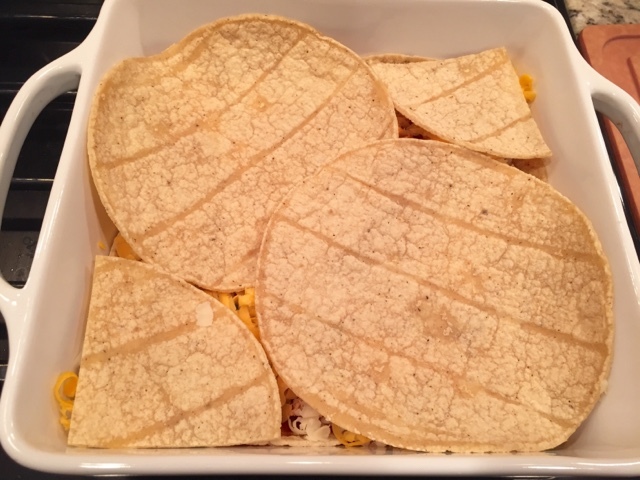 Serve in a tortilla and top with any taco fixin's you like. I love shredded pepper jack cheese, some avocado, fresh cilantro, and diced tomatoes. Heck, I love jalapeños, black olives, hot sauce, onions, and guac too! Whatever you like will be perfect! Enjoy, and as always, I love to see your pictures and hear your feedback! Feel free to send me an email, tag me on Instagram, or comment below. In case you missed it on Friday, my friend Lauren and I have teamed up to do another fun mini-series! This series is all about game day snacks and let me tell you, these are some goodies! 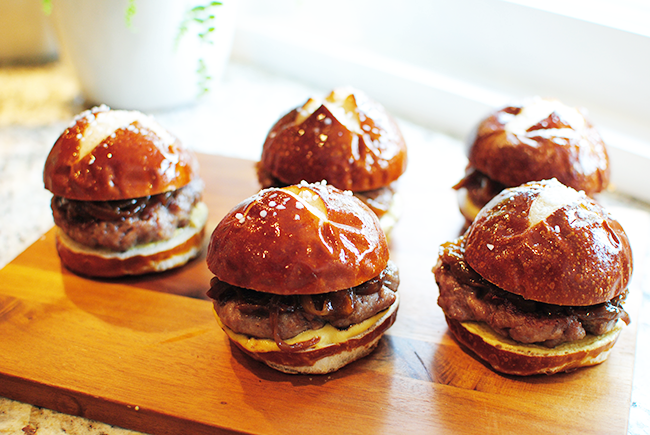 These brat burger sliders are a fun twist on two very classic game day eats-burgers and brats! In a nutshell, here's how to make these. *Cheese or beer cheese, optional but suggested!! Season the patties with salt and pepper. Cook these just like you would a normal burger, about 2 minutes on each side. You can use a grill, grill pan, sauté pan, etc. 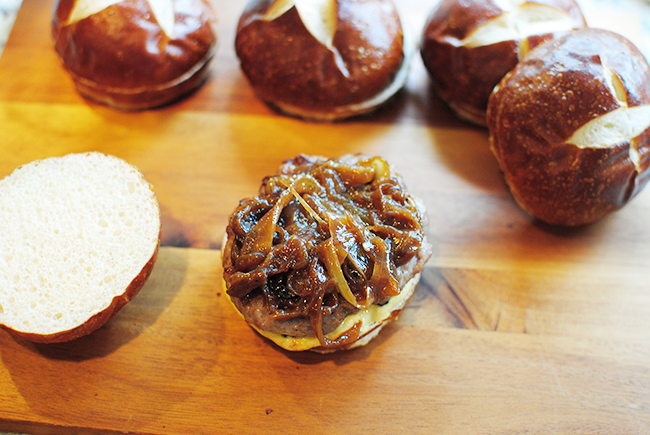 Spread the bottom bun generously with mustard, top with the brat, and finish with those jam-like caramelized onions. This would be a great time to smother it with beer cheese...if your feeling particularly adventurous! Warm your sauté pan over medium heat and add in the butter. Once it's melted, throw in your onions and give it a good stir, coating the onions in the melted buttery goodness. Turn the heat down to medium low and sauté until light golden. Add in about half of the beer and simmer for 15 minutes. Turn your pan down to low and just let the onions cook, stirring frequently. If the onions look dry, just drizzle in more beer. In about 35-40 minutes the onions will be deep golden brown and and your house will smell amazing! 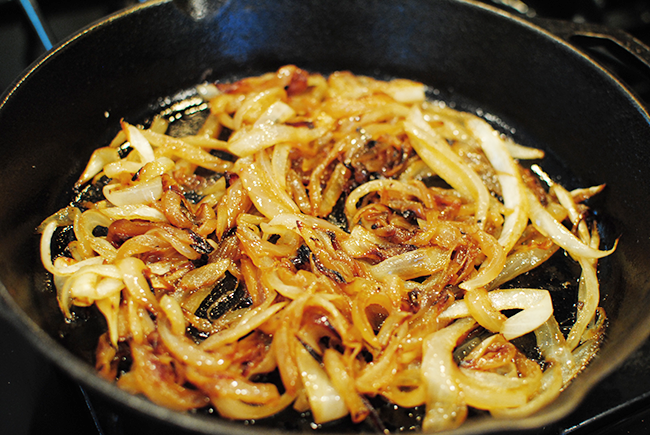 These caramelized onions are so yummy! Slightly sweet, so tender, and have great beer flavor. It's Tip-Thursday!! Well, that's not really a thing, but it's Thursday and I have a great tip for you! In culinary school I learned the importance of calibration. 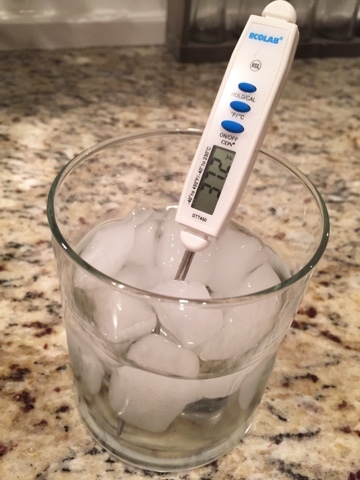 I would always keep my thermometer on my chef coat pocket and between the varying temperatures of the kitchen, dropping the darn thing, and overall use of it, I couldn't always trust the accuracy. With the holidays coming up it's so important to have a trustworthy thermometer to ensure your turkey or roast is cooked to perfection!